Thousands of people packed St Julian's seafront on Sunday to celebrate St Patrick's Day in the traditional way - with a pint, or two, of Guinness. Traditional Irish music blared from loudspeakers and people started converging early in the afternoon, many of them wearing green. However, while it was all fun and games for revellers, residents complained that the annual event was a “massive headache”. “Why in God’s name should we be expected to put up with thousands of people littering and doing all sorts of things at our front door, thumping music till the early morning, chaos on the streets? Shouldn’t this be organised somewhere more appropriate,” resident Mary Anne Agius said. “It’s just a bit of fun. We all get to enjoy the day together. People celebrate St Patrick’s Day all over the world, why not Malta?” he said, as he took a swig from his pint of Guinness. .“We held a meeting with stakeholders to try and find the best way to address St Patrick’s Day,” he said. The council organised a park and ride system to deal with the rush of cars to the area. The main roads had been shut off to vehicles and traffic police directed the flow of cars in and out of the area. Wardens had also been called in to patrol the side streets and a dedicated hotline was set up to process residents’ complaints. The council also brought bar owners together to share the cost of a street cleaning contractor to clear away the mess of bottles, cans and other rubbish normally left behind. Most streets were clean by Monday morning. Earlier, a colourful parade kicked off St Patrick's Day celebrations in Valletta. 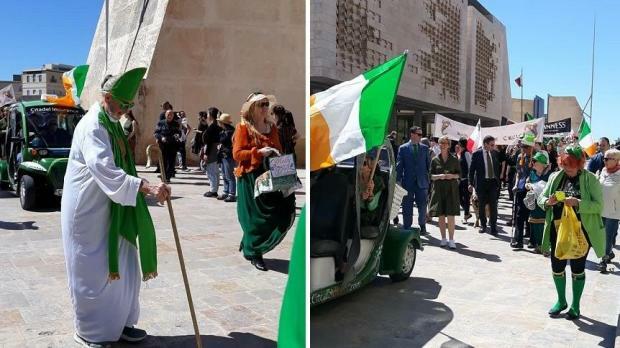 'Bishop St Patrick' and the enigmatic heroine 'Molly Malone' joined the Irish ambassador at the head of the parade down Republic Street, featuring a number of Irish characters and Irish music. More Irish music and dance, notably the stepdance, were performed on a stage at St George's Square. The activity is organised every year by the Irish-Maltese Circle. Those taking part included Claddagh Crooners, South Belfast School of Irish Dancing and the Marsa scouts band. The start of the parade in Valletta. Pictures - Anna Marie Navarro.